Microsoft was never particularly good when it came to update transparency and communication; while you could say that for a lot of companies, Google for instance, it always felt to me that Microsoft could improve the situation significantly with minimal resources. I talked about that in 2015 when Microsoft revealed that it would not publish KB support articles for all updates for Windows 10 anymore. Other instances where communication was sub-par was when the company decided to take away unlimited storage from OneDrive, the whole Windows 10 Telemetry fiasco, or the company's habit of releasing updates before publishing support pages that reveal what these released updates do. The release of the October 2018 Update, which should never have been released in early October 2018 because of the issues that it caused on some systems, may have pushed Microsoft in the right direction to improve update transparency and quality. 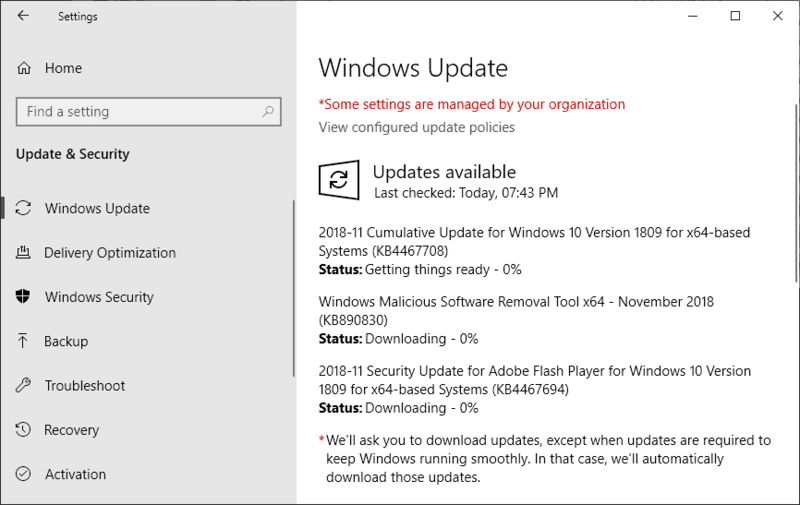 The very first thing that administrators and users may notice is that Microsoft listed all major known issues with the re-released version of the new feature update for Windows 10 on the Support page. I agree that it is a very weak indicator at the time but Microsoft did update the page several times already to add information about new issues to it. When Microsoft released the feature update on Tuesday, only one issue was listed on the page. On Friday, the list of issues rose to three and today, it is five issues that you find listed on the page. While it is certainly not speaking for the quality of the update, it could mean that Microsoft will finally start to provide vital information to administrators and users. Woody Leonhard noticed on Friday that Microsoft changed how updates are delivered. Instead of pushing updates to all Windows systems directly, Microsoft pushed the new cumulative update KB4469342 for Windows 10 version 1809 to the Release Preview ring first. The update will go through another round of testing and analysis before Microsoft gives the okay to push it to the release population. Microsoft needs to be transparent when it comes to updates for the operating system and improve communication as well. It is definitely a good idea to push updates to the release preview channel first before they are made available to the entire Windows population. Again, it is too early to tell if that is a new strategy in regards to update production and testing, or if that is just a short term change to avoid any more complications with the new feature update for the operating system. Can it be that Microsoft changes its strategy in regards to update quality on Windows 10 and transparency / communication in regards to updates? It is nothing more than window dressing. It is not in Microsoft’s interest to be transparent. To become really transparent it would need to change its business paradigm in a significant way, not just by altering a web page. Transparent, yeah, that’s the reason not to have change log/known issues with updates like the last one from MS – KB4469342 for 1809, v17763.165. Thanks for this useful historical perspective. Hopefully the justifiable ongoing negative press for Windows will bring about permanent positive change for Windows 10 users. I personally have used WU manually the day of an upgrade since Windows 10 was released, and have been fortunate to reap upgrade benefits without catastrophic consequences. The risk of doing so is tolerable for me to date, but new features I do not need or want, coupled with an alpha code mentality is something that must change by 1903, or I will have to find a new hobby. They will continue to annoy and piss off their customer base and eventually something will have to give? I am waiting for more concrete commitment before I worry about minor window dressing. MS needs to spend real money on internal testing and give Windows its proper internal visibility as key product. If neither happen then this is PR stunt to keep the wolves at bay temporarily. In other words, no real commitment, no more MS (all products). I had a good laugh yesterday. Carey Holzman was doing one of his live Youtube streams for less experienced computer users. He spent five or ten minutes talking about how Windows 10 “mostly self-heals” now as compared to earlier Windows versions, and how a lot of people who offer advice about Windows are relying on information that applied only to XP, 7 and 8, not 10. Then he goes on to install Windows 10 on a newly built system. He runs Windows Update to get all the latest updates. He goes to download the Nvidia graphics card driver directly from Nvidia, but the driver says it’s not compatible with this version of Windows. That doesn’t seem right, so he spends the next two hours trying to find out what’s wrong. One thing he notices is that Windows has installed its recovery partition on the wrong drive. He has two drives in the box, one NVME SSD and one hard drive. The OS is installed on the NVME SSD but the recovery partition is on the hard drive for no known reason. Then someone in the chat room suggests he uninstall the existing driver that Windows installed. He resists that for a while but finally goes ahead and does it. He also installs the AMD Ryzen motherboard chipset (something which he also wasn’t going to do, but I know is recommended to improve Ryzen CPU performance.) After uninstalling the Microsoft Update installed video driver, now the new NVidia driver is recognized and uninstalled. So what did we learn? That you can’t trust Microsoft Windows 10 to install properly, you can’t trust Microsoft Windows 10 to update properly, and techs don’t always know the right way to do things if they have a naive belief that ANY Microsoft product works properly. Not to mention that he was installing the latest Windows 10 Release – yeah, the crappy one. Which, given the bugs, I wouldn’t have installed until the user community was satisfied with it. He had to install it three times to resolve the NVidia driver issue. Oh, and of course once it was installed the first time, it had to take five or ten minutes of us watching a round circle while it figured out what drivers to install, excuse me, which drivers to screw up. Microsoft has never understood how to do installs or updates and never will. Respectfully, I remember Ubuntu Linux repeatedly installing a non-functional driver when I was dual booting anound a decade ago. I found a work-around that let me install the Windows driver for the wifi card with some sort of wrapper or program creating compatibility, but Ubuntu kept randomly replacing it with the driver that didn’t work, and seemed to get more forceful about it with every 6 month update. I believe what finally led to me deleting the Ubuntu partition and just using Windows was when I spent 7 hours trying to get Ubuntu to accept the driver I gave it, the only driver that had ever worked, and it really dug in it’s heels more than it had in the past and forced its driver, which didn’t work. I finally had enough and moved on. Fortunately, I could fix the issue with the wifi driver until the time where it became unfixable by using an ethernet cable to get the wifi driver working. These days, a lot of people don’t have ethernet cables, and there are plenty of devices out there without even Ethernet ports. So, its not just a Windows problem. And, yes, I tried Ubuntu again in a dual boot situation briefly a few years ago. That time, it worked fine on a different set of hardware, *but* it eliminated Windows from the boot screen and made it impossible to restore a working boot option for Windows from GRUB. The old edit the text file thing for GRUB didn’t work. It took me two weeks of trying before I gave up and instructed Windows to restore its bootloader and eliminate everything else, and deleted Ubuntu again. Maybe its just because I’m not a computer expert, but I remember spending a lot of time looking up answers and trying to engage online with experts and people I knew in real life, nd no dice. I had a friend who was an IT professional with Linux specific certifications who knew I was having issues about 15 years ago with a used Windows XP machine that was so overrun with issues and malware, with no restore disks available, that was borderlone useable, so he sold me on just wiping it and installing openSUSE Linux. I didn’t have wifi yet, and he literally started working on this when I visited him to watch a football game on television- he could not get the Ethernet port working. The sun rose the next morning and he was still working on it, knowing it was my only PC, I couldn’t afford a replacement, and he had sort of gotten me into it. We called it because he had been working forever and needed sleep and I needed to go home. I think he did finally come over another day and fix it or something. But to pretend that the driver issues on Windows are worse than the ones on Linux is just not accurate. I will say I have heard of more people having driver issues with Windows 10 than they used to have with Windows, and more people not having driver issues with Linux than they used to have, but it hasn’t flipped to where Windows is worse than Linux on this. Linux distros are somewhat handicapped in terms of being able to have consistently good driver support because they have less income and fewer employees or volunteers to throw at the problem, and because Linux is not usually preinstalled on PCs, which means that a lot of users are installing Linux on machines that the manufactures did not design with Linux support as a primary concern where they’d have to put a lot of effort into having great Linux drivers for it and maintaining compatibility with subsequent versions of any given distro (Or Linux in general). The answer to issues like that is probably to buy a Linux PC from a company that sells it preinstalled and maintains its only repositories with drivers that it keeps updated, and for the user to minimize chances for things to go wrong by sticking to LTS releases with just security updates and bug fixes rathet than upgrading to the newest feature version of the OS every 6 months, *but* stuff like System76 is more expensive than Windows PCs with comparable hardware, and doesn’t offer real lowcost options, and its one of the less expensive pure Linux companies that sell laptops with big screen and enough specs wise to be someone’s only computer. Its also not the sort of thing that you can search for big sales on from resellers or search for no credit check financing on or whatever. Its just a lot easier and less expensive to get a Windows machine, and then run Windows, because that’s what the drivers were specifically made and are maintained to be compatible with. I’ve often though if System76 or some other reputable Linux company could just find a way to do a good laptop for under $500 with, say, a 15 inch screen, an i5 processor, 8 gigs of ram, and a one terabyte harddrive, and keep those drivers working hassle free for the next 10 years, it’d be very successful. Even better if they could do it at $300 or $400, or offer financing to everyone and not just people with qualifying credit. Either that, or do like a $100 or $200 Chromebook-like laptop or harddrive, but with a much bigger harddrive and native non-web apps, and sell it as a secondary device, that’d do well, too. I doubt the above would be immediately profitable, but that’s the direction to go in to increase marketshare- inexpensive and with drivers that work and stay working. In the long-run, if the gamble worked, economy of scale might turn it from unprofitable to profitable. There are of course some known models of Windows PCs that have hardware that is well supported by Linux that people buy specifically to wipe and install Linux on immediately. But there you get back into having potentially higher costs and less hardware choice than one can afford or that one would find desireable. With so many manufactuers and sellers out there and competing for Windows sales, its easier to find something affordable and what someone wants if they look around. I feel like System76 really has its act together, but in the end if the cost is too high for some, its too high. Yes, Ubuntu used to have many serious issues around drivers, and that is why I gave up on Ubuntu years ago. Debian had none of those issues (despite Ubuntu being a Debian derivative). But I would argue that the difference between Linux distros and Windows is that, over time, Linux distros tend to improve. @John Fenderson: so are you running Debian now? Yes, on about a half-dozen machines, including my primary laptop. Indeed +1, the latest versions of Linux are excellent. I have only one machine Linux will not install on, a very old home made box with a Q6600 cpu. On all of my modern machines, where modern = 0 to 14 years old, Linux auto finds all drivers and installs from the iso disk without a single issue. Though, the older linux versions were not as reliable and usually gave me more kernal panics than uptime, the newest versions for the past few years seem solid and make an excellent all purpose OS. @Steve#99: which distros have you been using successfully? For various services at home such as file server, film/music streaming, etc we use a few Ubuntu servers spanning from versions 14 – 18.10. I think Ubuntu adopting netplan was a foolish, MS like, hairbrained move in the wrong direction. Thus for tools, I have a few specific boxes which run Ubuntu Server 14 to 16.x. They are used for things like wireshark with network cards in bridged mode, sass, angular, node.js, etc. If a shell is used for any of these, I use either Lbuntu minimal or XFCE (XFCE is not polished imho, but I like it). Due to bloatware, I stay clear of Ubuntu Client OS, Mint, etc (Unitity was the ugliest shell I’ve ever seen). However, if someone were looking for a solid OS and needs an office suite, I’d say you can’t beat Mint with Cinnamon; it’s a beautiful shell and probably the most finely polished of all distros. Software wise, all of the above installs perform flawlessly and require little maintenance. Hardware wise, all devices are recognized and operate as expected. The only flaw to date is on a laptop, the airplane mode button does not function. Ths OS does supply an airplane mode that works, I’d just prefer it were hardware based. PS: Though it might seem it, I’m not a Linux fanboy. Personally I think Linus is an arragant, immature manchild who gets equal contempt from me that I dish unto MS & Apple. But, that’s a discussion for another day. @Steve#99: many thanks for your elaborate answer. I currently have Linux Mint Mate installed in VirtualBox on a Win 8.1 host.M$’s recent mess of updates and patches have made me seriously consider to drop Windows after a 20-year run. I have lost confidence & believe M$ is out to ditch us home users. I am looking at Linux and Mac. What worries me most is device recognition by the distro, although I have the impression that that is by and large solved now for most of them. You’re welcome and btw, Mint is a great choice; especially if you need the Office suite. I know allot of people who love Mint and I frequently have a Mint VM running myself. Before you commit, a good way to find out if a potential OS suites you is to leave it in the VM and force yourself to use only that VM for all your task. In a few weeks you’ll know what is good and not about that OS. I think your dual boot apprehension is smart. I usually have single OS machines and use vbox VMs when expanded task call for it. That way, the host stays nice and tidy with just the essentials and maybe a few luxuries. If the VM trial goes well, remove your hard drive and replace it with a substitute. Install the OS of interest on the substitute. This way, you can see if your hardware is compatible before you fully commit. And then, you can continue with your trials to get a real feel for the OS. I’d say your approach is good where you’re taking your time and experimenting. Especially with a decision as massive as leaving an OS. But I think in the end, leaving Win 8 will be very easy for anyone and release you from one of the most truly awful OS ever written. @Steve#99: once again thanks for this elaborate reply too, it is good to get feedback like that. I started in February with Mint in VB, then lost interest a bit and did not do anything till this month, having seen, though experienced, M$’s disastrous updates and patches. AskWoody is a great site that gives th green light when it is not dangerous anymore. I only do the security updates. Anyway I fired up VB again, and when I wanted to check out Elementary, I realised VB was actually a beautiful “mechanism” to dabble a bit in some other distros. So I downloaded about 6, incl. Ubuntu, PureOS, Elementary, …. I don’t like Elementary: I could not install things from the repository, and could not easily find some things. It might be me, but I don’t want to have to fiddle around. Mint and Ubuntu are user friendlier IMO. I don’t what you mean by “Ubuntu adopting netplan was a foolish, MS like, hairbrained move in the wrong direction”, I guess it is something to do with “systemd” (don’t what that means either) that someone else mentioned, but playing around will presumably make it clear. Sorry, I should not have mentioned netplan, that was a mimi rant. netplan is the new way to configure networking in Ubuntu. They made it much more complex than it needs to be. You only deal with it when you run server without a shell. netplan abstracts away the once straight forward network settings. It forces you to use an xml like file which then configures the once straight forward text file. You mentioned an interest in Apple. In VBox, you can also create a Mac VM in many of Mac’s different varieties. I had a few friends that toyed with Mac Vms out of curiosity and it looks identical to a real mac. Also, my youngest used to build hackintoshes; which is a mac that runs on a standard x86, non-apple computer. You might want to look into that if you like Apple’s OS in the VM. It’s pretty easy to do but requires a few hours of building. He eventually got bored with the Mac OS, went back to windows, and has been using Mint for the past few months. * installed Solus, uninstalled it pretty soon afterwards because Firefox would not keep the changes I made, I am not prepared to spend hours trying to figure out something; I did not try to dig into Solus’s deeper workings. * Antergos, not installed (yet), just using the trial side – no deep experience yet. * PureOS, trial only, uses its own browser which froze my PC, so dropped it. * Debian, installed it, but then would not accept my password when I wanted to log in. Found instructions as to how to change the password, which went fine, but it still would not accept it. I changed the pw about 4-5 times, still no joy. So I uninstalled it – very disappointing because I had high hopes. * open SUSE Tumbleweed, installed today. Played about 2 hours with it. So far I like what I see of this distro, Firefox reacts properly, holds the changes I made. Bidirectional clipboard works flawlessly. The clock shows the right time. The program is also quite snappy, maybe even a bit snappier than Mint, although that needs to be confirmed. There is more command line action required, unlike Mint, so that is a challenge to see if I can get a handle on it without having to become a coding expert. I’ll definitely need to do a deep dive if I want to seriously consider this one. Trying out Mac in a VM is a very interesting idea indeed, so will definitely try that out. I read that making a Hackingtosh is not a good idea, though I forgot the reason. I am surprised your son now uses Mint, considering he got bored with Mac; surely there are more challenging distros than Mint? Anyway, it’s none of my biz. It sounds like you are trying the full span of linux. If you are still having fun, try minix and puppy linux in a VM; they are minimalist distros. Also, minix is the OS Linus copied which became linux. You’ll delete them after an hour, so it will be just for kicks. It’s sad that a few shortcuts devs take can turn a person away from an OS for life. The fact you couldn’t log into to Debian will probably taint your perception of it for a long time because frustration creates deep memories. It’s like MS’ misguided decision to force a phone interface unto desktops. The shell along with the invasive spyware in Win 8 & 10 will be a blight on MS’ reputation for decades, as Vista still hurts MS bad reputation for putting out crapware. Windows Phone is another disaster. It could have been great but MS’ forcing it to market early with with a nonfunctional clipboard, which did not work for almost a year, turned people off for life. Back in the late 90s, I had a beautiful Toshiba CE PDA. Unfortunately, it would sometimes take me 45 minutes to retrieve a phone# because CE was just horrible. After the fourth time, I went to Palm and decided never to use any portable device that used an MS OS. That is now 20+ years of no matter what MS comes out with, I instantly regard it as a no buy, stay away; zune, surface, win phone, pda, et al. Now, take their flagship OS “Win 10 Spyware”. How long will it take for MS to regain tech savvy types trust? Same as MS Wallet, it will never happen; MS will forever be marred as a blight to privacy and usability to many in the tech world. This same boycotting applies to other companies such as Sony for their rootkit CDs and high end $1000 DVD players that malfunction after 13 months. MS, Sony, et al can make a quick profit in the short run, but lose once loyal customers for life; along with all the opinions influenced via the bad press & word of mouth opinions conveyed. Speaking of Mint, I started playing with a Mint VM more since last we spoke. Out of the box, Mint is a bit green but easy on the eyes. After customizing Mint’s themes & colors, it is the most beautiful desktop I have ever seen — FAR more beautiful than Windows. I have used Mint in the past and it was never a speed demon. The new version is better but I can hear the VM occasionally heat up my W520’s I7 2.4gz (fan noise). I have a faster unused HP 8300 so I will be installing Mint on that for an extended trial. Hardware wise, I can’t fully get rid of Windows 7 because of Adobe MS CS6 & my music workstation. But Mint is the shell that is going to replace a few Windows 7 boxes, it is just so pretty after being customized. I will even try Libre Office instead of uninstalling it like I originally intended; I looks decent enough. It will feel really good getting MS mostly out of my home, for many reasons. @Steve#99: good talking to you again. I will give Puppy and Minix a try for fun. I agree with your comments about M$ products. I also agree about your Mint products. I tried for hours to install VBox guest additions in openSUSE but failed, so I decided to lake a look at Mint again after many months. Boy, what a relieve to be able to do so much with GUIs instead of with command lines in openSUSE. And the quickness, or absence, was actually more than acceptable. I have made an inventory of the programs I am using in Windows that have Linux equivalents. The one I am a bit concerned about is Excel, mainly for the so-called Excel Tables, which I use a lot. LibreOffice, even v.6, cannot handle them. WPS Office says it can, and its Windows version is pretty decent but its Linux version can handle them somewhat, not quite, but the tables look absolutely atrocious – not acceptable. So I uninstalled WPS from Mint. Will have to think of something else. No, I won’t try the whole range of Linux distros, there are too many. But if I see one that looks kinda interesting I download the iso image an run it in VB without installing it if it allows me. I don’t spend too much time, just enough to give me a comparison with Mint. Yes, I am disappointed about Debian, could not find a solution and apparently it was a bug at one stage. I am taking my time to fully evaluate Mint, and perhaps 1 or 2 other distros. Yeah, Excel tables & pivot tables are buggers. You could install Office in a VM which will run on Mint (or wine). This is why I love VBox so much, it allows you to make mistakes in a snapshot and revert to a pristine box in a matter of minutes. My killer apps that not on linux are low rent in comparison to Excel; foobar2000, xplorer2, TextPad, mp3Tag, Mythicsoft FileLocator Lite, FSViewer & Maxview, ironically PuTTy, and 40ish custom utilities I’ve written for various purposes. Other than VLC, most linux audio/video players lack appeal and are completely devoid of any form of “cool factor”. As long as I’ve been playing the nix playground, I’ve never used Wine nor even looked at it and instead, opted for running VMs. I’ll have to check Wine out this coming weekend in a VM. Maybe it can run my killer apps above in a way that performance is not too bad and usability is transparent. If so, that would be awesome. @Steve#99: I have more or less come the conclusion that Mint is probably best for me, so I will eventually install it, 1st as dual boot, and, if I am daring, eventually put Windows in a VM. I will also take a look at Wine in coming days, probably install it in my VB Mint and see what it’s like to run Office in it. Today I also found some interesting Linux alternatives for Windows programs that don’t offer a Linux version. So things are looking up by the day. I still need to get more familiar with the way files and folders are structured and inter-related. * macOS – the Hackingtosh site did not “allow” the download (5Gb), nothing happened when I clicked on the download button. * Puppy Linux: it does not go full screen, but what was worse was the cursor – very jerky and when it gets near the edge another cursor “takes over” but does not let you do what you want to do. * Minix – not 64-bit version. I have not consulte it yet but intend to do so farther down the road. Buy we are talking about Microsoft here and the only goal of Microsoft is to maximize their profit in short term with no real vision of the future. Microsoft the king of the improvisation. I’d consider a company and Microsoft in particular given their chaotic, insane Windows10 updates, to test their wandering fixes with non professional testers. Skilled users often make their way and when I read the way they describe how they manage to deal with Microsoft’s updates I realize their skills are not those of average users… and it is those “average” users who pain day after day, update after update to just be able to use an OS calmly, efficiently. I think it’s in Microsoft’s genes to perceive users as medium/senior managers, dynamic young executives all nested in their offices when the reality is far more diverse with a majority of us spread all over the spectra of jobs and a minority sitting down at their bureau. Martin, I have the feeling that you’re a are already optimistic because of a swallow! In the Netherlands, there is a saying which says “A swallow does not make a summer yet! Is this new openness of Microsoft not prompted by the period Black Friday, Christmas and new year, who is just around the corner? I think Microsoft is possibly forced in this frankness by big hardware and software suppliers to give hardware and other software insight so they can plan their already gigantic losses. Wouldn’t it be likely that there are already quite a few companies on the verge of collapse due to Microsoft’s failure, especially if it will take even longer for them to lose their products in the most important sales period of the year? No they are going to keep going along as they have been, being predatory to their customers and other software companies, putting out a half broken product because they can as a monopoly, and forcing you to go through their store for everything, thereby removing the last vestiges of user freedom from their bloated closed-source mess of an OS. 1. How much do you know about Linux? Not much it seems, otherwise you would know that there are plenty of distros where command prompts are not more needed than in a Windows set-up. 2. Yes, macOS is a solid alternative to Windows, yes the machine design is beautiful. But why don’t you mention that the components in those machines cannot be repaired because they cannot be taken out as they are riveted/glued/etc. to the chassis? 3. As for Apple respecting privacy more than M$, how much more respectful? I believe there is perhaps a bit more of it, but why is all the software proprietary? And what do you know about the physical components, are you sure there is no spying going on? 1. I’ve done my time experimenting with the many existing distros, both popular and esoteric, from the bloated Ubuntu with Unity to the forever-compiling Gentoo and everything in between. It’s just that after spending years doing that, my non-computing job became more intense and I just got fed up with the constant fiddling. I’ve moved, pretty gracefully I should say, from Windows (all versions from 3.11 onwards) to my current MacBook Pro 2016 and have not looked back. 2. That’s a compromise many users are willing to make because of the guaranteed compatibility of the hardware with the software. 3. Although I cannot guarantee that Apple doesn’t spy or collect user data, they have a far more consistent track record in this field and I am a little more comfortable entrusting them with my data. Nothing’s ever perfect in the cyberworld, but Apple still beats MS in my view. @ShintoPlasma: you make a compelling case for using a Mac, and I understand where you’re coming from. Nevertheless, regarding point 2 I fail to see the relationship between irreparability and “guaranteed compatibility of the hardware with the software” – the 2 issues are unrelated. Your fan can break down for reasons nothing to do with that compatibility. My old mother uses Ubuntu and she has never used the terminal. She can install and uninstall software easily. She mostly uses Chrome and it works perfectly, all the programs and the system are updated without reboots, she doesn’t even notice the updates. She is very happy with it. It’s funny talking about constantly monitoring linux for breakage when these days Windows is the buggiest operating system in existance. Perhaps because those two things stopped being something that the ordinary user needed to do many years back. Its good to see them paying more attention to not shipping with showstopper bugs and being catious to advance to all their insider rings and give them more time to run changes through their paces, even when it means significant delays. When dealing with issues like data loss, its very important that you are triple 110% certain its been fixed before destroying people’s music collections, office documents, or whatever- especially when the stable version updates are mandatory and automatic. It’d also be good to see the main focus go to to fixing security issues and bugs, and improving general stability over adding features that few people are super-enthused with. The question, of course, is whether this is a change of direction that will last, or whether its a temporary wat of compensating for what happened with 1809, with a return to a less cautious approach as soon as this spring. If its semi-permanent, great! But I have my doubts. Time will tell. Obviously no, no effort windows 10 today is a service not an operating system as we knew it. The test is in the disastrous management hidden cryptic updates and delayed effects on your pc. A support based on eliminating physical personnel that attends to your complaints, now they are the engines of the robotics. In the end you do, you are looking for solutions outside of windows to the problems. If it is not for blogs portals or sites where honest people help to put light on windows their occultations and here I outline the enormous thanks to Martin Brickmann you would navigate in the dark. Thank God there are alternatives to this disaster and I advise Martin tutorials towards Linux to migrate your PC to open mind! Whenever MS PR masquerades to convince they are a kinder & gentler company, MS performs many other actions that betray that masquerade. Though I make my living on their product 30 years running, when I think of MS I see little more than greed, concealment, hidden agendas, ulterior motives, dishonesty, and a hatred MS has for the public. My take on this is the M$ is (IMO) a monopoly. Sure, there are a couple of “competitors” (Linux and Mac OS), but Linux is *still* not ready for prime time, is probably kept that way via industrial sabotage (after all, it *is* open source) and most people don’t like the expense involved in purchasing a MacIntosh. Because M$ is (again, IMO) a monopoly, they will continue to behave with as little regard for the end user as possible. The very existence of Windows 10 pisses me off badly because currently, it’s been preventing me from upgrading my computer since it came out. The following is all IMO (sorry, again): Satya Nadella needs to go, needs to be replaced by somebody who isn’t evil, insane and a U.S. government sellout. @John C.: if M$ were amonopoly, why would Google have been allowed to completely displace IE with Chrome, or the M$ Office suite by the Google Office suite? I agree with your last para: Win 10 has gone this way since Nadella took over, and he needs to go. But that depends on how the shareholders see his performance and his business model; the latter may well include ditching those pesky home users from whom the mark-up is probably not financially interesting anymore. In any case the Win 10 saga shows that Windows is no longer a viable option for me as a home user, so I am actively investigating an alternative while I still have time till 2023 with Win 8.1. Technically, something can be a monopoly without engaging in monopolistic practices. For example, if I ran a company that controlled the world’s peanut butter supply, I could *in theory* still charge a fair price for it and not mandate that it only be purchased in bundles with my less desirable jelly and bread brands. So, one *could* say, as you kind of did, that Microsoft is not currently using it’s monopoly power to force it’s Edge browser down everyone’s throat, and that would probably be accurate. That doesn’t ipso facto mean that it isn’t a monopoly, though. I think they pretty much know that they’d be face regulatory sanctions if they did things like tried to hardcode something that prevents users from using other browsers by default or whatever (Especially since their previous behavior in regard to browsers got them slammed with major sanctions in both the United States and the European Union). I do definitely see small ways they use their operating system to favor their own software, though, you can read the articles on this site alone and see that for yourself. I do think it’s a monopoly. As implied above, the mere presence of some kind-of alternatives in a market does not by itself prevent something from being a monopoly. The reason people think you literally need 100% of the market to be a monopoly is because people are often taught about monopolies using very obvious examples to make it easier to explain- and the 100% marketshare monopolies are the easiest clearest examples to give people the general gist of what being a monopoly means. However, if, for example, MacBooks are out of the reach pricing wise of large portions of people, Chromebooks don’t do a lot of operating system type functions, and preinstalled Linux PCs are not widely available or price competitive (or are too hard for a lot of the users in the marketplace to maintain)- that’s still a monopoly, because you’re not really competing directly for the same pool of users. All the non-Windows options are only options for certain groups of people, and at least the one arguably isn’t in the same category (Chrome OS is technically an operating system, but not in the same sense as most prior operating systems), the majority of Windows users are realistically stuck with Windows. And, yes, distinctions are made by economists based on price and stuff like that. One could say that Windows, for example, has a monopoly on the $800 and below full-operating system market, but that the monopoly doesn’t exist in the $1000 and above full-operating system market because of Apple. You can be a monopoly in some categories and not others. Of course, some people will try to expand it and say phones are now computers and then there is no Microsoft monopoly at all and, while they have a point in so far as phones are computers in some respects (And some people or families who have to pick between smartphones or PCs for economic reasons do choose smartphones), there are definitely some use cases where phones can not serve as an adequate substitute for a full service PC (laptop or desktop). Anyway, I’d say that Microsoft is still a monopoly at this point in many categories. They often walk the line of becoming an illegal monopoly by abusing their monopoly power (A monopoly itself is not illegal, it’s when the monopoly abuses it’s monopolistic position that it starts to violate the law- at least in the countries who’s legal systems I’m most familiar with), but *lately* I think they’ve either stayed on the correct side of that line or jumped offsides but quickly gotten back onsides when the public has noticed. Historically, obviously, this has not been the case. The market could obviously benefit from a true competitor to Windows across every category, even if some of us wind up continuing to use Windows, simply because a competitor might push them to do things better more consistently so they can retain a higher percentage of their user base, and would likely bring down prices. The problem is that the most likely company to be able to do this is Google, but Google wants to push everything online where it makes its ad money, so the best they are going to do is some psuedo-OS like Chrome OS that is mainly Internet based and not a competitor to full-service OS. Apple would be another one, but they aren’t interested in making budget or mid-range computers and prefer to position themselves as a luxury or premium brand. So, it is what it is- for now. I think Linux could make a push, but it would require a lot of money, enough money to push tons of advertisements across all media for the laptops and price the products below cost for a while, while also paying a dedicated team of employees to fix all the issues average people can’t fix and create GUI options for everything (To the point where Terminal isn’t a default pinned option to the dock or taskbar, at least), and someone getting the support of major OEMs. Actually, I suppose a major OEM could be the one that does the above, but it’d have to be a real effort and not just what Dell does in releasing a laptop or two with Ubuntu every so often. And a real effort would be a huge financial risk and ruin the business they have with Windows, a business relationship that’s working out. Also, if they do this type of thing, they’d need to dramatically expand their help desks with employees who have expertise and live in the country the PCs are bought in, because even if they make a Linux distro that works as well or better than Linux, they are still going to be inundated with calls from people who thought they were buying a Windows laptop or who just don’t understand the different but equally simple way hypothetical way of doing what they did on their Windows laptop (That they learned 20 years ago and repeated every day for 20 years) on their Ubuntu laptop. M$ has a market-monopoly in the high-value enterprise market since the 1990s, especially with MS Office. “Follow the money”. The low-value consumer market is expendable for M$ = M$ couldn’t care less. Hence, M$’s apathy in consumer relations and lack of transparency/information. Also forced auto-updates/upgrades and shorter EOL for Win 10 Home & Pro. Problem is, if M$ loses her market-monopoly in the consumer market, the enterprise market will likely follow suit. IBM just bought Red Hat Inc = non-free RHEL, free CentOS and free Fedora. This could become a winner against M$-Win-10 if some vital changes are made by IBM. If Google-Android could win against M$-Win-10-Mobile, I do not see why IBM-RHEL-CentOS-Fedora cannot do the same. Presently, free Fedora has a very short EOL of about 13 months for each new release/version which comes every 6 months as an upgrade = must upgrade at least once-a-year in order to stay supported = similar to running Win 10 Pro. Free CentOS, based on RHEL, has new releases/versions every year and an EOL of about 15 months = must upgrade every year in order to stay supported. IBM needs to follow and add the Ubuntu LTS release model which comes out every 2 years and is supported for 5 years, to her present non-LTS Fedora and CentOS release model. It is a fact that most computer users, be it at home or the workplace, prefer the LTS release model, eg can upgrade every 3 to 5 years, instead of every 6 months or every year. Fedora and CentOS, in their present form, do not cut it for them. Also, IBM needs to make Fedora fully GUI-based = as user-friendly to the masses as Win 7/8.x. An RHEL version is supported for 10 years, only because it is paid support = companies have to pay annual subscriptions from Year 1 to Year 10. Free Ubuntu 18.04 just announced that they can provide companies with 5 years of paid extended support, ie 5 years free support until EOL in 2023 + 5 years paid extended support from 2023 until 2028 = 10 years of support. Previously, it was only 3 years of paid extended support, ie for Ubuntu 16.04, 14.04 and 12.04. If IBM won’t do it, then hopefully Canonical Inc-Ubuntu will be bought up by Amazon or Google or Oracle and make Ubuntu fully GUI-based. @AnorKnee Merce: very good point. @John: technically you are correct about your description of a monopoly, but in the case we are talking about it is academic. If M$ has a monopoly, as you argue, but does not use it by charging a fair price, then in practice it is not a monopoly because consumers are not negatively affected.